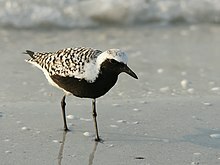 The grey plover (Pluvialis squatarola), known as the black-bellied plover in North America, is a medium-sized plover breeding in Arctic regions. It is a long-distance migrant, with a nearly worldwide coastal distribution when not breeding. The genus name is Latin and means relating to rain, from pluvia, "rain". It was believed that golden plovers flocked when rain was imminent. The species name squatarola is a Latinised version of Sgatarola, a Venetian name for some kind of plover. They are 27–30 cm (11–12 in) long with a wingspan of 71–83 cm (28–33 in) and a weight of 190–280 g (6.7–9.9 oz) (up to 345 g (12.2 oz) in preparation for migration). In spring and summer (late April or May to August), the adults are spotted black and white on the back and wings. The face and neck are black with a white border; they have a black breast and belly and a white rump. The tail is white with black barring. The bill and legs are black. They moult to winter plumage in mid August to early September and retain this until April; this being a fairly plain grey above, with a grey-speckled breast and white belly. The juvenile and first-winter plumages, held by young birds from fledging until about one year old, are similar to the adult winter plumage but with the back feathers blacker with creamy white edging. In all plumages, the inner flanks and axillary feathers at the base of the underwing are black, a feature which readily distinguishes it from the other three Pluvialis species in flight. On the ground, it can also be told from the other Pluvialis species by its larger (24–34 mm, 0.94–1.34 in), heavier bill. They migrate to winter in coastal areas throughout the world. In the New World they winter from southwest British Columbia and Massachusetts south to Argentina and Chile, in the western Old World from Ireland and southwestern Norway south throughout coastal Africa to South Africa, and in the eastern Old World, from southern Japan south throughout coastal southern Asia and Australia, with a few reaching New Zealand. Most of the migrants to Australia are female. It makes regular non-stop transcontinental flights over Asia, Europe, and North America, but is mostly a rare vagrant on the ground in the interior of continents, only landing occasionally if forced down by severe weather, or to feed on the coast-like shores of very large lakes such as the Great Lakes, where it is a common passage migrant. The grey plover is one of the species to which the Agreement on the Conservation of African-Eurasian Migratory Waterbirds (AEWA) applies. ^ BirdLife International (2012). "Pluvialis squatarola". IUCN Red List of Threatened Species. Version 2013.2. International Union for Conservation of Nature. Retrieved 26 November 2013. ^ a b c d e f Hayman, P.; Marchant, J.; Prater, T. (1986). Shorebirds. Croom Helm. ISBN 0-7099-2034-2. ^ Jobling, James A (2010). The Helm Dictionary of Scientific Bird Names. London: Christopher Helm. pp. 311, 363. ISBN 978-1-4081-2501-4. ^ a b c d e Snow, D.W.; Perrins, C.M. (1998). The Birds of the Western Palearctic (Concise ed.). Oxford University Press. ISBN 0-19-854099-X. ^ Dickinson, M.B. ; et al., eds. (1999). Field Guide to the Birds of North America. National Geographic. ISBN 0-7922-7451-2. Wikimedia Commons has media related to Pluvialis squatarola. "Grey plover media". Internet Bird Collection. 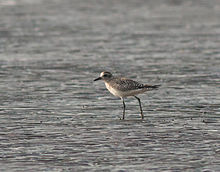 Audio recordings of Grey plover on Xeno-canto. This page was last edited on 5 September 2018, at 00:02 (UTC).